How do you convince complete strangers to market your book—and have them be happy to do it? Cross-promotion! 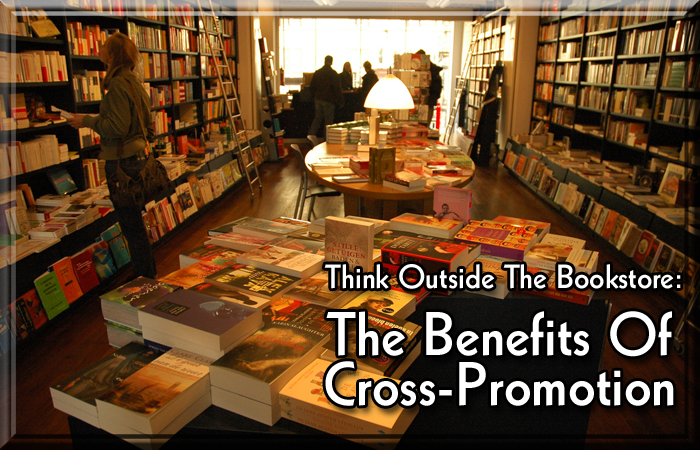 Quite simply, cross-promotion is when two parties agree to promote each other’s product, service, or interest, to the benefit of both. One well-known example of cross-promotion is the McDonald’s and Disney partnership. Disney releases a blockbuster movie with memorable characters, and McDonald’s promotes the characters with toys in kid’s meals, on packaging, on in-store posters and displays, and in its advertising. Then, fans of the movie go to McDonald’s for the movie-related products, and people eating at McDonald’s are inspired to see the movie. Everyone’s a winner! Products, services, or members’ interests that are in harmony with the subject of your book. A target market or audience similar to yours. A commitment to the concept of cross-promotion equal to yours. Benefit them financially or, in the case of a nonprofit, edify its membership. Benefit you by increasing the sales of your book and getting your name out there. How? Let’s say you’ve written a novel set during the Revolutionary War. Every state in the nation has historical and “lineage” societies whose members are interested in American history. These groups have periodic meetings and are always looking for engaging experts to speak to their membership. You can contact these groups and offer to speak for free (or at a reduced rate) with the understanding that they will let their membership know in advance that you will be bringing copies of your new book, which will be available for purchase at the meeting. You might even consider offering your book at a direct discount to the organizations, allowing them to sell your book to attendees and pocket some profit. The group can also publicize your upcoming appearance on its website with a link to yours. You can announce the engagement on your website and social media profiles with links to theirs. Retail service shops and product stores—If you’ve written a book on some aspect of beauty, consider cross-promoting with beauty salons, nail salons, make-up studios, or spas. If the protagonist in your play is a chef, cross-promote with restaurants. Is the femme fatale in your mystery novel a clotheshorse? Consider cross-promotion with upscale clothing boutiques. For your nonfiction book on the history of champagne, wine boutiques may be a great fit. Common-interest associations—Every conceivable topic has an association of like-minded people that is ripe for cross-promotion. Religious groups—Books touching on religion or spirituality may be of interest to church groups. You wouldn’t suggest a speaking engagement at a service, of course, but why not at a church or temple dinner or social event? Business groups—Your local Chamber of Commerce, Jaycees, and professional associations are fertile ground for cross-promoting books, both fiction and nonfiction, that touch on any aspect of business. Civic organizations—The myriad of associations whose mission is to do good, such as Kiwanis, would be a good choice for cross-promoting your novel about the doctor who leaves it all behind to serve abroad. Writers groups—Your writer peers may not share your interest in the particular topic you’ve written about, but they do share your interest in the craft. Offer your expert opinion on technique. Or join forces with other writers and create your own power promo team. The key to successful cross-promotion is to remember that it is not self-promotion. Instead of thinking What’s in it for me?, think What’s in it for us? QUESTION: What kinds of cross-promotions have you done, and were they effective?